Darius Madison (Jr., Philadelphia, Pa.) scored the equalizer late in regulation, then headed in the game winner in overtime to lift the No. 19 UVA men’s soccer team to a 2-1 win over James Madison Tuesday night at Klöckner Stadium. Trailing for over 70 minutes, the Cavaliers (5-3-1) scored with 1:32 remaining in the second half on Madison’s first goal of the season, then won it on Madison’s golden goal with 3:13 left in overtime. 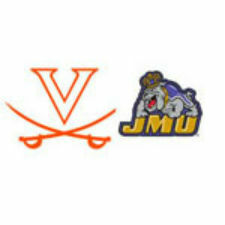 Virginia out-shot JMU, 12-11, including 3-0 in extra time. JMU had a 7-4 edge in shots on goal. The Cavaliers took 11 corner kicks to five for the Dukes. The match was chippy throughout, as UVa was whistled for 17 fouls and JMU 15, while the teams were shown a total of six yellow cards. Virginia goalkeeper Calle Brown (R-Sr., Leesburg, Va.) made six saves, including five in the second half. JMU goalkeeper Kyle Morton made a pair of saves. JMU (4-4-2) scored in the 16th minute as Jamal Umar tracked down a long pass down the right flank, then worked back toward the top of the box, where he unleashed a rocket that found the back of the net, just under the crossbar, for his second goal of the season. Brown came up with a huge save in the in the 60th minute. After a UVa yellow card gave JMU a free kick 10 yards outside the top of the box, the Dukes sent a dangerous free kick over the wall and Brown made a terrific save, poking the ball away from just under the crossbar near the right corner. Frustrated all evening, the Cavaliers broke through in the 89th minute. UVa pushed deep into the box as Patrick Foss (So., South Riding, Va.) corralled the ball near the goal line and sent it back toward the goal. With Kyle McCord (Sr., Chester Springs, Pa.) charging in, Morton dove for the ball but it deflected off him and Madison banged in the rebound. The Cavaliers cashed in for the golden goal in the 97th minute. Eric Bird (Sr., Virginia Beach, Va.) sent a long cross across and deep into the box, where Madison headed the ball into the upper left corner for the winning score. Madison became the first Cavalier to score twice in a game this season. Virginia hits the road for a pair of matches before its next home game. The Cavaliers travel to Pitt on Saturday and head to No. 20 George Mason next Tuesday (Oct. 7). UVa returns home Oct. 11 to play Duke.